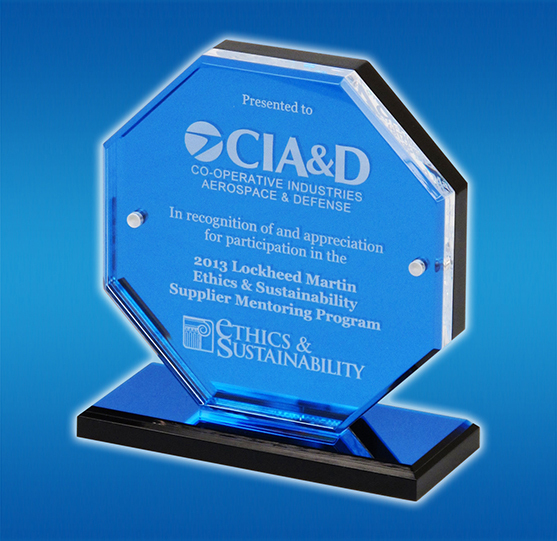 On November 20th, CIA&D was recognized by Lockheed Martin for their participation in the Ethics Mentoring program. CIA&D, one of seven suppliers from across the country, took part in an ethics exchange program with the Lockheed Martin Ethics & Sustainability group. Working in partnership with the Aeronautics division, CIA&D established a more robust ethics policy consisting of procedures, communications, and training. From the increase in regulations to recent headlines, Ethics is becoming even more important to business success, and survival, than ever before. Ethics impacts the bottom line. Active steps, such as reviewing and continuously improving our Ethics program, contribute to the message to the customer and the business community that CIA&D values and understands the importance of ethical behavior. The Lockheed Martin Office of Ethics & Business Conduct, with the support of Global Supply Chain Operations, partnered with suppliers to share best practices, resources, and experiences, all with the aim of creating a stronger ethics program throughout the supply chain. This voluntary program included an objective review of the supplier’s existing Ethics & Business Conduct program, and recommendations for improvement. Each company was partnered with one or more Ethics Officers, who was available as a resource throughout the program. By participating in this program, CIA&D intends to further its reputation not only as a supplier of quality wiring harness products, but as an ethically motivated team whose focus is on the customer.